Pictured above: Route map shows initial phase of America’s Natural Gas Highway, a network of LNG fueling stations along main trucking corridors being built by Clean Energy to support the growing deployment of natural gas-fueled trucks for goods movement. Image credit: Clean Energy. With around $450 million invested in 2011, the project is a game-changer, enabling the heavy-duty trucking industry to make the move to natural gas by reducing the perceived fear of range anxiety. Fleets can be anxious about switching from diesel to natural gas because they believe there is not enough fueling infrastructure in place to permit them the same range of travel. America's Natural Gas Highway will help quash those fears with its robust network of fueling stations, while also helping to alleviate the US's dependency on foreign oil. 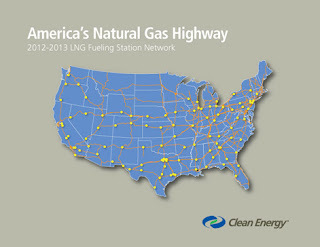 The planned network's first phase involves a backbone of 150 fueling stations, and Clean Energy anticipates that it will have 70 stations open by the end of 2012 in 33 states. The first major highway segments that are planned for early opening include those linking San Diego-Los Angeles-Riverside-Las Vegas; the Texas Triangle (Houston-San Antionio-Dallas/Ft. Worth); Chicago-Atlanta, and a network of stations along major hiqhways in the mid-west region (IL, IN, OH, MO, KY, TN, KS, OK, AL).